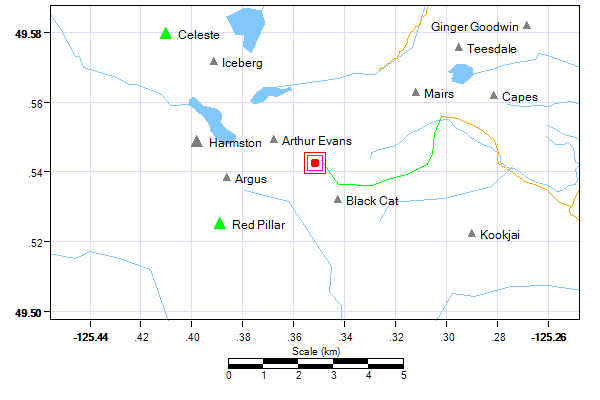 (19 km E of Westmin Mine). (25 km W of Cumberland). (3 km NE of The Red Pillar). 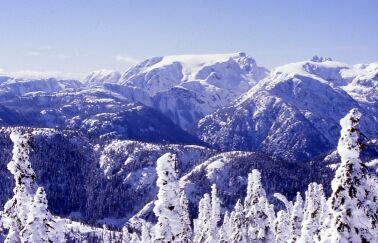 Located on Vancouver Island, about 25 km SW of Courtenay.. FtrAccess: The traditional access to Comox glacier drives from Cumberland to Bevan, out along the North side of Comox lake, across the high bridge over the Cruikshank river, right up the river, left (south) where the stream from Capes Lake comes in, then right again up Comox Creek (pretty much where the Ck in 'Comox Ck' is), and driving upstream as far as possible. There has been a lot of logging in this area in recent years, perhaps even including right up to the park boundary and right over the start of the Comox Glacier trail. Therefore I can't say how far one can drive or where one normally parks. Traditionally there were a couple of small bridges suspect or missing, so that creeks had to be forded by vehicle late in the summer. The road likely ends somewhere near the letter "m" in Comox Ck. (49:33:08-125:17:44). The trail goes up the ridge immediately north of Datsio Ck (called Black Cat Ridge) to the famous campsite called the Frog Pond. The difficulty of access is partly the active logging that has been going on here in the last couple of years and the need to coordinate with the loggers work day and the truck traffic. But there have been stories about access issues related to fire closures, lack of fire insurance, lack of a two-way radio, etc. It's a mess.